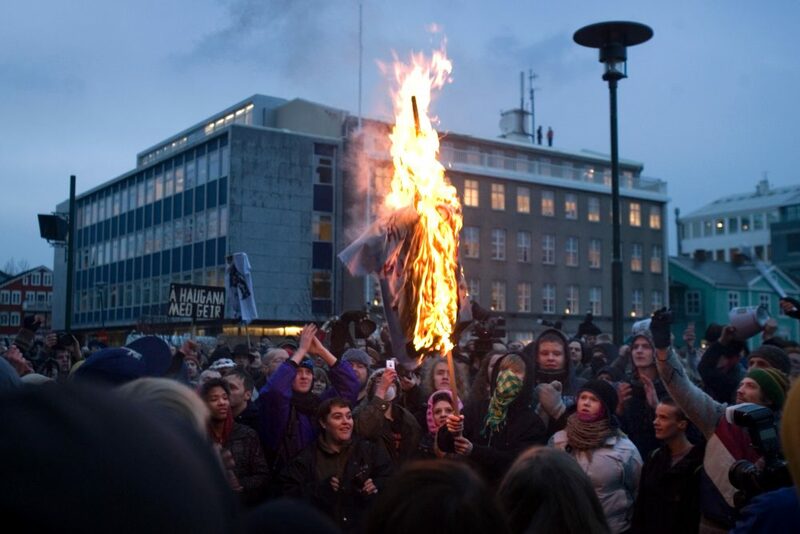 Protesters burn an effigy of the Icelandic Prime Minister Geir Haarde during a demonstration over the handling of the financial crisis, in Reykjavik, Iceland’s capital, on Jan. 21, 2009. Photo by Thorvaldur Kristmundsson/Associated Press. What can we learn from the Vikings? I usually write in this space about the economies of the Pacific Rim, and the lessons they hold for policymakers in the United States. But this year, Iceland, with its stunning beauty, is the place to go on vacation, and so I headed to the other side of the planet. Settled by Vikings in the ninth century, Iceland was one of the first proto-democracies. Those Norse settlers held their rudimentary version of parliament, called the Alþing (Althing), at Thingviller, the rift where the North American and European plates are tearing apart. From its inception, Iceland was part of a globalized world—first as a dominion in the far-flung lands of the Vikings, and later linked with European commerce. That linkage—essential for a country with fewer people than the city of Santa Ana, California—continues to this day, although the current prime minister’s Independence Party, now leading a coalition government, has serious questions about the value of European integration. The trouble with globalized Iceland is that its connections to the outside world have been accompanied, and strained, by a relatively severe business cycle. Why? The causes are too many to name here, but two stand out: trade and finance. Finance casts an especially long shadow. We in the United States thought the financial crisis of September 2008 was bad, and it was. But in Iceland it was much, much worse. Beginning in September 2008, Iceland suffered a financial crisis during which 90 percent of its financial system evaporated, all of the major banks defaulted and were nationalized, and the value of the Krona fell by 50 percent. It has been described as one of the worst financial crises of any economy in modern history. In September and October of 2008, when the banking system exploded like so many Icelandic volcanoes, Icelanders faced the same choice that many countries, including the United States, confronted: backstop the banking system, or let it fail and start over again. The Icelandic Independence Party was in power at the time of the crash (though it had not been in power during the preceding “banks-gone-wild” period). And so the party tried to reassure their countrymen that Iceland, like all other countries facing huge systemic debts, needed to step up to the plate and guarantee the private debt of the banking system. This is similar to what Ben Bernanke and the U.S. Federal Reserve decided to do in the fall of 2008. But that was not to be. The Icelandic Independence Party’s coalition government, which (full disclosure) was led by my University of Minnesota classmate Geir Haarde, fell in February 2009. Eventually, Sigmundur David Gunnlaugsson’s Progressive Party came to power with a different point of view. We in the United States thought the financial crisis of September 2008 was bad, and it was. But in Iceland it was much, much worse. … It has been described as one of the worst financial crises of any economy in modern history. Gunnlaugsson, who rode a wave of anti-bailout sentiment, decided to default on Iceland’s international debts. His view was that foreign investors should have known the risks they were taking in exchange for the high returns they hoped to receive. Now that the risks had materialized, Gunnlaugsson asserted, they ought not look to others to help them. “Icelanders, as descendants of the Vikings, are highly individualistic and have difficulty putting up with authorities, let alone oppression,” is how he colorfully put it after the election. The results: Iceland’s banks went under, the bad debt was put into a resolution authority for sorting out, and a new, much more conservative banking system arose from the ashes. The new banking system improved regulation, instituted higher bank equity requirements, and established strict stress tests, similar to what the U.S. implemented, but perhaps a little more restrictive. And Iceland itself did not go under. In fact, the Icelandic economy has recovered quite nicely since then. That’s in part because taking decisive action was possible in a small, homogenous country. It’s also because the important parts of the real economy—agriculture, renewable energy, fisheries, and tourism—were still solid, despite a moribund banking sector. As Geir Haarde put it, the hull of the Icelandic economic ship was strong, with only the superstructure being damaged. Fixing that superstructure by creating new banks with more restrictive regulation, and with bridge loans from the International Monetary Fund, engendered a return to prosperity. Today, demand for fish is growing, tourism is hot, and economic activity has diversified into marine and renewable energy technology. From the Ocean Cluster House on the docks of Reykjavik to the large geothermal-heated greenhouses in Fliori, Iceland’s non-financial economic activity is booming. The question is whether the new monetary system can meet its promise to smooth out fluctuations in the business cycle. History provides reason to worry. Iceland remains exposed to the world economy and, as a small player, is going to be buffeted by it in the future. There is an Icelandic aphorism: to lay your head in water. It roughly means to think about what you are doing and perhaps come up with a new and better solution. Economists from the Bank of Iceland are doing just that. They recently studied the past 150 years of Iceland’s economic history and found financial crises in Iceland are the rule not the exception. Of the 20 financial crises studied, five were quite similar to the 2008 implosion. The common thread is that they arose in conjunction with adverse global financial events. Iceland did not go under. In fact, the Icelandic economy has recovered quite nicely since then. That’s in part because taking decisive action was possible in a small, homogenous country. The option of isolating the economy from the rest of the world exists, but this is not very palatable for a small trading country. Another more radical solution was proposed in a government-commissioned study by Frosti Sigurjónsson: establishing a sovereign monetary system. The basic idea is to eliminate fractional reserve banking; that’s the system whereby banks can leverage depositors’ funds through loans to others. By eliminating such leveraging, banks can be sure that they have enough funds to cover customers’ deposits during a financial crisis. In a sovereign monetary system, banks play a transactions-only role. They take in deposits, charge a fee for storing and processing them, and facilitate transactions. Effectively, the banks become a big mattress for putting one’s money under. A bank cannot be insolvent because it always has on hand 100 percent of customers’ deposits. More risky investments may be made via investment banks similar to mutual funds in the U.S. For these, the customer is not guaranteed a return nor guaranteed the ability to withdraw their investment. There are some technical issues about monetary policy in this system, but they can be resolved relatively easily. The real cost of a sovereign money system is that the deposits are now idle. In Western banking, deposits are put to work as loans that generate new economic activity. That doesn’t happen under the Icelandic bank mattress; the money just sleeps until the customer is ready to withdraw it. If Iceland were to implement such a system, it would be an instructive experiment in monetary economics. Whether successful or not, we would learn something about how to better manage the systemic risks of the banking system. However, it would be very difficult for the United States to adopt such a policy. Be that as it may, can we in the United States learn something from the Icelandic financial experience? After all, major financial panics with significant impacts on the U.S. economy occurred in 1819, 1837, 1873, 1893, 1907, 1929, and 2008. In the wake of the Panic of 1929, significant banking reform in the United States was instituted, including the Glass-Steagall Act of 1933. Eventually, through subsequent regulatory changes and the Gramm-Leach-Bliley Act of 1999 (signed by President Bill Clinton), some restrictions on bank activity were repealed. That the longest episode without a major financial panic occurred during the time Glass-Steagall restrictions were in place may be significant, or it may be a coincidence. Economists who study this period have not settled the question definitively. But we don’t have to know the answer to this question to take a lesson from Iceland’s Vikings. For countries with recurrent financial crises, there may be a real danger in rushing to return to the old banking system, as some of current efforts to repeal important sections of the Dodd-Frank financial regulation bill seek to do. Rather, taking your time is vital. There are complex interactions in the globalized banking system that should be analyzed with methodical care, considerable thought, and an eye towards economic history. While that all seems very reasonable, I am reminded of a line from one of Icelandic musical superstar Björk’s hits, “There’s definitely, definitely, no logic to human behavior.” When one believes that financial markets are always and everywhere self-correcting, they may indeed be living in a Björk song. Jerry Nickelsburg, an economist at UCLA Anderson School of Management, writes the Pacific Economist column. He would love to hear from you at Jerry.Nickelsburg@Anderson.UCLA.edu or via Twitter @jnickelsburg.